This Miniature Australian Shepherd nicknamed Mocha sold and went to a new family. We raise Miniature American Shepherds, better known as Miniature Australian Shepherds, even better known as Aussies or Miniaussies. Good information regarding the breed is available at MASCUSA.org. Puppies will be eligible to be registered with the AKC as Miniature American Shepherds. Mother, "Dessie", is a blue merle. She weighs 30 pounds and stands 17" tall. Dessie is a sweet, sassy, obedient gal. She loves to be active and was a successful participant in 4H dog obedience and agility. The father is our "Bowen". He is a beautiful black tri and weighs around 45 pounds. Bowen is a very handsome happy go lucky boy. He is playful and outgoing and has received his Canine Good Citizen and Community Canine titles. Both parents are registered with the AKC as the new Miniature American Shepherd. The Miniature American Shepherd is the new category the AKC has opened up for the Miniature Australian Shepherd or fondly know "Mini-Aussie".The mother is shown by their Puppies will be ready to go home March 14,2016 when they are 8 weeks old. Until then we keep pretty busy raising them within our family structure. They come in and out of the house after being whelped in a nice little kennel cottage complete with heat and air conditioning. The placing of a puppy in a home will always include a contract with some practical agreements between us. We carefully consider potential homes and use the Volhard Puppy Aptitude Test to help match puppies with families. Puppies are raised carefully with a lot of family interaction as they grow. Parents are health screened, as are the grandparents and some of the great- grandparents. Our puppies make great family companions and should finish between 25-40lbs. 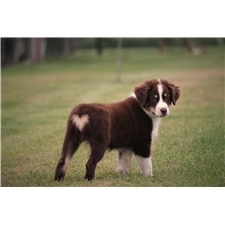 They should be great examples of the Miniature American Shepherd in body and ability. The puppies were born 10/28/2017. Tails were docked by our vet and dew claws were removed. They will receive their first vaccinations with the vet and regular deworming treatments will be given. At 6 weeks of age we will administer the Volhard Puppy Aptitude Test. They will be ready for their homes 12/23/2017 at 8 weeks of age. We are located in Northern Indiana and most folks take their puppies home although shipping is available through the United Airways Pet Safe service, out of Chicago. Please feel free to call and we can chat about your interest in one of these amazing dogs.